Saturday August 17th at the Latino Comics Expo in Long Beach, CA, I ran the best panel I’ve ever done or been involved with. Entitled “Bring on The Lucha Heroes: 60 Years of Mexican Masked Wrestlers in Comics” it consisted of a half-hour slideshow on vintage fotomontaje comics by Jose G. Cruz and ilk, followed by commentary and Q&A with a host of folks keeping those traditions alive today — Rafael Navarro (Sonambulo), Jason Gonzalez (La Mano del Destino), Dan Madigan (Ultimo Dragon graphic novel series) and SoCal luchador Lestat, who has a digital motion comic of his own adventures in the works! L to R: Jay Gonzalez, some gordo nerd boy, Lestat, Rafael Navarro and Dan Madigan. We had a packed room, they even added chairs for late arrivals, and went way over time (kudos to Javier Hernandez for scheduling us last for the day so we could) with rapt interest from the audience. And that’s what I wanted to talk about here — audience reaction. What I was watching in front of me during the slideshow was a lot of wide eyes, an ocassional dropped jaw, and a lot of those captivated squints you get when someone is confronted with something they’ve not only never seen before but never even heard of existing. Basically, it’s comics fans discovering a a lost continent’s worth of amazing material they never knew about, followed by the realization it was only three hours down the road and across the border all this time. But let me back up a bit for those unfamiliar with the silver mask in sepia tone. It started late 1951/early ’52-ish when the one-man Stan Lee/Jack Kirby that was Jose G. Cruz launched Enmascarado de Plata, a 5×6″ comics digest starring one of lucha libre’s up and coming tough guys El Santo. 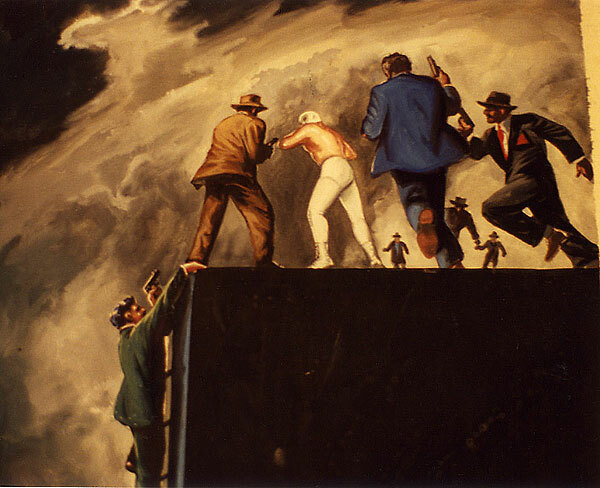 Unique to the Mexican comics industry at the time was the technique of fotomontaje, of which Cruz and art directors like Jose Trinidad Romero and Horacio Robles were the major pioneers. Santo himself was brought into a photo studio and modeled dozens if not hundreds of poses against a blank background — punching, kicking, running, jumping, challenging evil doers arms akimbo, delivering dialogue in Shakespearian poses — all sorts of stuff that would be reusable in serialized adventure panels. 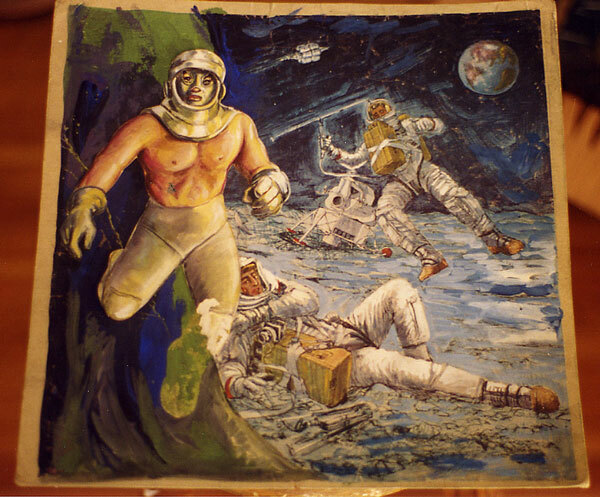 The Santo figures were contour cut and collaged into page layouts embellished by other photographed models, background pictures (sometimes shot slightly out-of-focus to give the illusion of depth like a Viewmaster reel), painted elements, illustrated motion lines and finally speech balloons. The results were fantastical comic book adventures that at the same time benefited from the reality that Santo himself was right there on the page. It was here that much of the lucha-hero tradition was born. Santo was Mexico’s ring champion but also the city’s moonlighting superhero. As an enmascarado he was of course more capable of dealing with supernatural threats than mere police and military, although a tried and true camel clutch or chair to the head worked wonders even on the otherworldly of opponents. And otherworldly they were! Unlike the modest-to-low-budget films that followed, the only limit of fotomontaje was the imagination. Cruz and his artists pitted Santo against dinosaurs and dragons, cavemen and space aliens, suits of Conquistador armor possessed by ghosts, demons from hell itself and more. 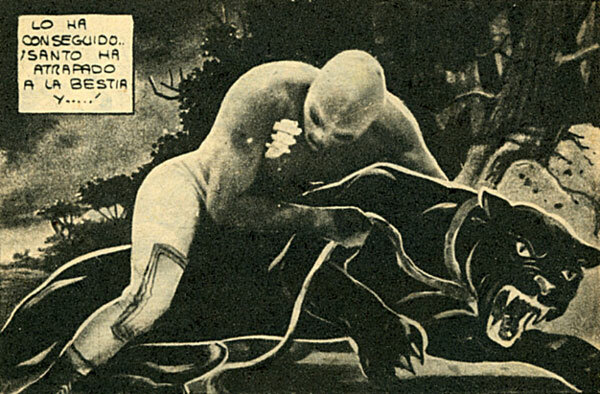 He fought a mega octopus underwater, sans scuba gear, and walked on the surface of the moon… shirtless. He flew over a zombie, vampire and werewolf-besieged city in a jet pack and landed on a moving motorbike as easy as leaping off the top rope. And yes, while masked wrestlers like Medico Asesino and Huracan Ramirez and luchador-like masked characters such as Sombra Vengadora and Neutrón battled criminals in the primordial days of the silver screen, the lucha-hero movie era as most of us know it begins with Santo vs. los Zombies, a decade after the comics books established him as the go-to monster fighter. Twenty years of enmascarados fighting creatures and crazies on the big screen followed, and it is those films that near exclusively embody the lucha-hero idiom’s posterity, certainly outside the borders of the Latin world. They’ve been dubbed for drive-ins and subtitled for Blu-ray, haunted late night cable in the 80s, lit up VHS tape trading boards in the first days of the internet and are now showing up on streaming services and even in whole on YouTube. But if the comics did it first, and arguably better, why aren’t they basking in the same retro fandom? 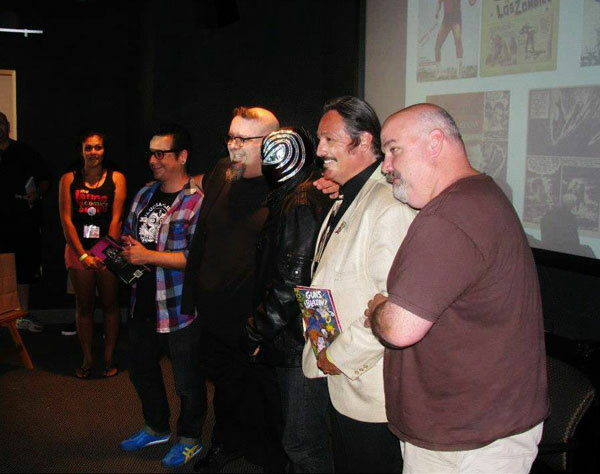 Why did my Southern California based audience at a Latino comics convention hardly know the pulp legacy of their culture’s masked icons? Part of the answer lies in the series’ popularity back in the day. Findings and anecdotal accounts vary, so I always quote the lower brackets of numbers that have been put out there by researchers*, but at its height, El Enmascarado de Plata was selling 500,000 copies per issue, and those issues were being cranked out via factory-like art studios three times a week! That’s 6,000,000 copies circulating per month. On top of that, nuclear families passed the issues around to two-to-three generations of readers per household, THEN one could sell back those family-worn books to the newsstand for credit towards new issues. The used stuff sold at a discount to other households, so when all was said and done up to a dozen readers could have thumbed through each copy. Suffice to say everyone in Mexico was reading the silver mask in sepia in some fashion. Evidently lucha masks are not only water proof, they afford their own breathable atmospheres (when needed) during fights with sub-aqueous critters. That many readers per copy, combined with low quality newsprint and 50-60 years of Mexico’s heat and polluted city air and whatnot makes for some rather rare back-issue shopping. And the fan culture wasn’t the bag-and-board it collector mentality we’ve benefitted from here. Reprints? Treasury editions? No such luck. Cruz and Santo had a major falling out in the early 70s, and a spiteful publisher continued the series with a body builder named Hector Pilego donning a variant silver mask. The ‘fake Santo’ era took a lot of lustre off the formerly sainted (literally) property and some inferior series followed. Numbers crept down year after year, and the old-timey-looking sepia-toned books never adapted to the new color age, so by the early 80s Cruz pulled the plug and bugged-out of the business, leaving behind a legally ambiguous estate. 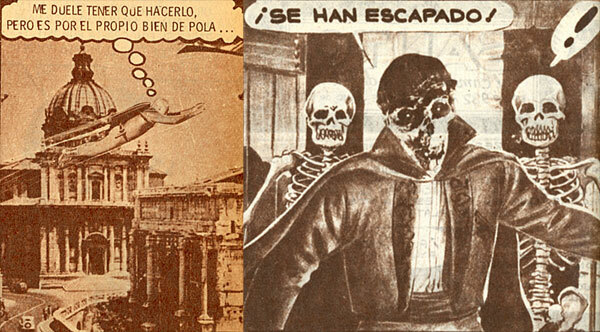 The 1970s ‘fake Santo’ in both repurposed old layouts (above) and obviously newer ones (below). Although the art quality suffered during these latter eras, the Jose G. Cruz painted covers (often derivative of famous works or contemporary movie posters) got stranger and stranger! Although I’ve heard accounts of some original art pages being stored in the archives of Hijo del Santo, as a graphic artist and publisher myself, I have a feeling the old original pages were pulled apart back in the day so the elements could be reused in subsequent storylines. Several years worth of material was also re-published in Mexico as well as Central and South American markets with the ersatz Santo pasted over the original, so that art would likely be lost in its virgin form anyway. The leather-bound hard-cover below collected a month’s worth of stories. Readers could send their books to the publisher where they were stripped of covers and bound as proto-graphic novels. Thing of it is, a modern-day English-language tome that sheds light on this lucha-hero universe could be done. NEEDS TO BE DONE! An avid collector in the audience asked why the Craig Yoe‘s of the world weren’t translating and reprinting these books for all new audiences. Dammit, there’s just no good answer to that! 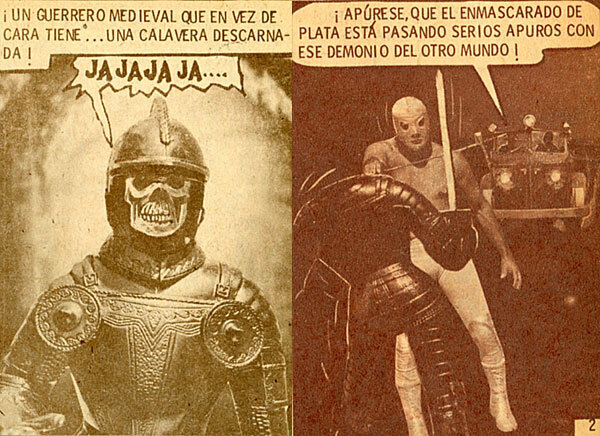 The lucha-hero fotomontaje series are major pieces of world comics history. They need to be preserved and exposed to new generations the same way Japanese and European treasures have been all along. If educating roomfuls of people and connecting the classic material to great newer stuff from El Borbah and Love & Rockets to Sonambulo and La Mano del Destino can help, then call me a crusader. In the meantime, my advice as a fan is to start poking around various warrens and caves of the interwebs. People are starting to scan their beat-up old collections to post online, and while I as FPU publisher can’t outright endorse (or directly link to) such behavior, if a bit of the old yo-ho-ho is what it takes to preserve this lucha-hero legacy then the more it all gets “shared” the better. Thanks to everyone who was in the audience at the Latino Comics Expo, you cats were a great audience! And major congrats to the show promoters for such a successful weekend. See you all next year! 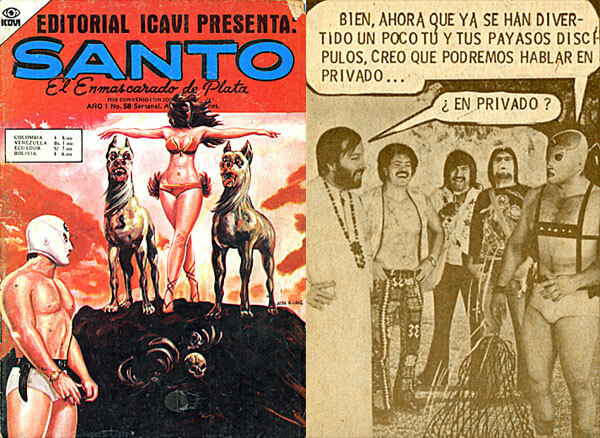 *Not Just For Children: The Mexican Comic Book in the Late 1960s and 1970s by Harold E. Hinds Jr. and Charles M. Tatum and David Wilt’s chapter “El Santo: The Case of a Mexican Multimedia Hero” in Film and Comic Books are the best English-language resources I’ve found so far. Thanks, and congrats, for running such a stellar panel. You’ve been such a key resource over the years I’ve known you for all things Lucha Libre, so I’m glad that your presentation and guests went over so well. I suspect there’s a whole new wave of lucha comics resurgence happening as we speak….